Little Green Sprouts is an indoor gardening program that gives students the opportunity to grow and eat healthy food right I their own classrooms! 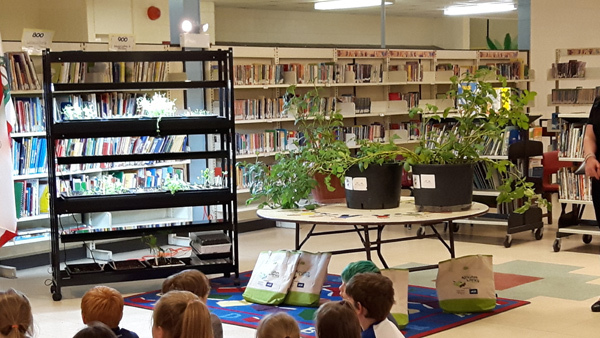 Your students will have engaging learning experiences with our curriculum-based programs connecting students and agriculture! We work in partnership with many organizations to develop and deliver educational experiences your students will love. We ensure all of our information is accurate, balanced and current. Teachers across Canada are adding this powerful learning tool to their classrooms. Little Green Sprouts is trademarked and managed by Agriculture in the Classroom Saskatchewan, and is growing across the country with schools from Newfoundland, Manitoba, Saskatchewan and Alberta. Light gardens are a two tiered indoor garden and are perfect for a classroom setting. You may apply to become apart of our light garden project (see below). We have 10 light gardens that go out 3 times a year. (September, January, and March). What comes with your light gardens package? Name* *This field is required. *This is not a valid name. E-mail* *This field is required. *This is not a valid email. School's Phone* *This field is required. *This is not a valid phone. Grade Number* *This field is required. Session* September January March *This field is required. County* Select a County *This field is required. School* Select A County First *This field is required.